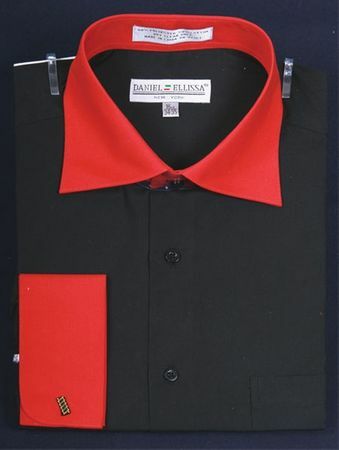 Need a black and red collar dress shirt for Your gangster style getup, this black and red collar dress shirt from Daniel Ellissa will make it happen. This shirt comes in a regular fit with a single chest pocket and french cuffs that really bring out the style. Great for both zoot suits and fashion suits, the bold style and colors of a black and red collar dress shirt has plenty of attitude. Made of cotton/poly blend fabric.